The #HappyHaulerDays ugly sweater was crocheted by hand and the amount of yarn used covers half a football field. Ugly holiday sweaters usually capture attention when worn by people. 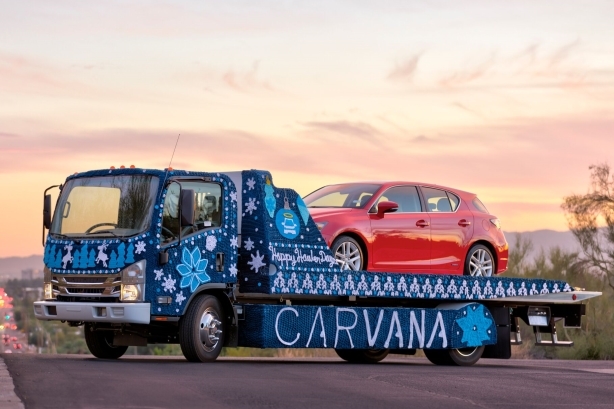 So as a clever way to garner brand awareness, used car delivery company Carvana took the festive fashion trend a step further and wrapped its signature vehicle haulers in ugly sweaters over the holiday season. Carvana began planning for the campaign in early summer 2017. The overall goal of the #HappyHaulerDays campaign was to increase Carvana brand awareness through social and community engagement. "Once we landed on the hashtag, we wanted to come up with something that really plays off the holiday season of giving back and the ugly sweater concept," explained Ryan Keeton, co-founder and chief brand officer at Carvana. "Ultimately, we wanted to approach the campaign in a way that we could touch a large number of our markets across the U.S."
Once the idea of wrapping a hauler with an ugly sweater came to fruition, the brand chose to partner with London Kaye, a yarn artist based in Los Angeles and New York, for the design. The campaign launched on November 16 with the ugly sweater-wrapped Carvana hauler appearing in posts on social and the company blog. Each week, fans could win an ugly sweater by snapping photos and sharing the hashtag. On December 6, the brand released a behind-the-scenes video of Kaye creating the crocheted wrap. The video had a paid push on Facebook and YouTube. "Videos were produced and edited internally," said Keeton. "We shot content during the first week of November and were able to turn the video around within just a couple weeks." The original yarn design was used to create vinyl wraps that were sent out to 11 markets for a six-week run. Markets featuring hauler wraps included: Houston, Atlanta, Phoenix, Los Angeles, Virginia Beach, Nashville, Orlando, Cleveland, Indianapolis, Dallas, and Miami. Carvana also used the sweater-wrapped hauler at several events and volunteering opportunities, mainly around the Phoenix-area where the company is headquartered. Over Thanksgiving weekend, the company entered a Phoenix holiday lights parade and had staffers ushering the hauler through the event wearing ugly holiday sweaters. The brand got exposure to an estimated audience of 530,000 at two Phoenix-area holiday lights parades, with the Carvana hauler taking home the prize for "Best Large Commercial" at one parade. The #HappyHaulerDays social contest had nearly 75 entries, with six "ugly sweaters" awarded to winners. The brand noted a daily Instagram follower increase of 15-20 followers during the campaign. The behind-the-scenes video on Facebook reached about 1.2 million people. The campaign landed coverage in outlets including Phoenix Business Journal, Bizwomen.com, the Phoenix ABC-affiliate, and the Atlanta NBC-affiliate.